Elitewood vs. Alumawood vs. Weatherwood? What is the difference between Elitewood, Alumawood & Weatherwood? This is the most commonly asked question from homeowners and it’s often misunderstood. It very important to understand that there are 2 brands of Elitewood aluminum patio covers. There is Elitewood Ultra and Elitewood Classic, both manufactured by Four Seasons Building Products in Buena Park, CA. 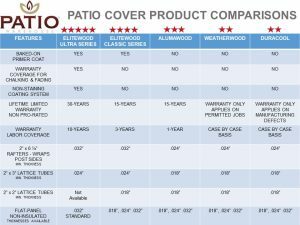 Elitewood Ultra is the superior patio cover product on the market. It features the most beautiful and realistic deep driftwood texture, 25% thicker gauge aluminum beams, and an impenetrable Kynar 500 paint coating. Elitewood Ultra is the only patio cover product that has a non-staining coating system. Lattice patio covers are often susceptible to “black streaking” on the rafter beams due to rain or morning dew washing the sitting dust down the vertical sides of the beams; however, a simple hose will easily wash those black streaks away with NO staining! This can not be said for all the other patio covers products which can stain if not properly maintained. Elitewood Ultra also comes with a 30-year materials warranty & 10-year labor warranty. This warranty also covers fading & chalking, which no other patio cover product covers. Keep in mind, Elitewood Ultra will have a higher price point then Elitewood Classic, Alumawood or Weatherwood. Elitewood Classic looks the same as Alumawood & Weatherwood, just made by different manufacturers. Elitewood Classic is manufactured by Four Seasons Building Products. Alumawood is manufactured by Amerimax. Weatherwood is manufactured by Duralum. Elitewood Classic, Alumawood & Weatherwood, when held side by side, look the exact same; however, Elitewood Classic has 25% thicker gauge aluminum beams and has a primer coat of paint. So, don’t be fooled! All 3 aluminum patio cover products feature a light cedar wood texture & Teflon paint coating. Although the Teflon coating does provide added shininess to the finish, it isn’t comparable to the Kynar 500 paint finish on the Elitewood Ultra. This is clearly demonstrated thru the warranty which covers 15 years on material & 3 years on the labor for the Elitewood Classic. Alumawood & Weatherwood only cover 1 year on labor. So, if you’re trying to decide between Elitewood Classic vs. Alumawood or Weatherwood, go with the Elitewood Classic. It has a better warranty and is installed by more qualified contractors. Keep in mind neither warranty covers fading or chalking, so if you’re thinking about installing a color besides white then consider upgrading to Elitewood Ultra. Weatherwood virtually has the same warranty as Alumawood but does not cover unpermitted structures. Another assurance that can put homeowners at ease, is that Elitewood Ultra & Elitewood Classic can only be purchased by licensed & insured contractors with long standing reputable businesses. Start up companies, and the guy next door, typically use Alumawood or Weatherwood since a contractors license or insurance aren’t necessary to purchase from those manufacturing companies. Due to their superior cost effectiveness, aluminum and vinyl are among the top materials for home renovation projects. While we could build our patio covers and sunrooms with many materials, Patio Warehouse uses aluminum products for their combination of durability, efficiency, and cost savings. In Orange County, California, the constant sunshine creates a friendly climate, but it’s not as kind to vinyl. Over time, vinyl can fade, warp, and crack. Aluminum withstands the elements, providing long-lasting strength and style. While both aluminum and vinyl are easy to maintain, Patio Warehouse chooses aluminum for our Elitewood patio cover and Sunscape Sunroom projects because of its ability to provide a lightweight frame that can be embossed with attractive woodgrain patterns and coated with protective enamel and custom paint colors. Aluminum stands as one of the most affordable building materials. While vinyl is also included in the cost-effective category, aluminum can be easily enhanced with additions like baked enamel coatings, which provide energy saving protection against the harshest elements. From high-end patio enclosures to louvered patio covers, aluminum construction offers upscale dependability at sensible prices. When you are considering adding a sunroom or a patio enclosure to your house, you only want the very best. Choosing the right sunroom contractor can mean the difference between a worry-free, easy process that results in a family gathering spot you enjoy for years to come—and a stressful situation that ends up feeling like a waste of time and money. While it may seem like a better idea to go with a larger, franchised company with offices all over the country, we highly recommend choosing a smaller, locally-owned company. Sunroom contractors who have lived and worked in Orange County, CA for their entire professional lives are not only more invested in their community, they are also better-versed in the building codes, the local permitting process, and inspection procedures in your area. Choosing a non-local company can result in expensive fines and delays and make your entire experience less enjoyable. A good contractor should not only be willing, but also happy and proud, to show you examples of past work. When you look at a sunroom installer’s past projects, make note of quality, consistency—and also variety and versatility. You want a contractor who can make your sunroom addition look and feel like part of your original construction, not one who takes a quick, cookie-cutter approach. If you find a sunroom contractor who you like, but you notice that every project looks the same, keep searching. Nothing is worse than a sunroom that looks like it was tacked on as an afterthought. At Patio Warehouse, we pride ourselves on our design-build skills. We’d love to you to browse our sunroom galleries and our other past projects. What former customers think about their sunroom contractor’s work really says a lot. Fortunately, we live in the age of Google Plus, Facebook, and Yelp, so you can do your research before hiring a sunroom installer. When you check a contractor’s reviews, look for things like reliable customer service, professionalism, and the ability to deliver on time and on budget. Many of our former customers consider us the best sunroom contractors in Orange County, CA. We gladly invite you to check our references! Online pictures can show you a lot about the quality and consistency of a sunroom contractor’s work, but visiting a showroom can give you an even better sense of the materials the contractor uses. At Patio Warehouse, we use the highest-grade, deeply embossed aluminum products that give your new sunroom addition the look and feel of real wood. We also use the best, most energy-efficient glass in the industry—glazed, tempered, insulated, and able to filter out up to 99% of harmful UV rays. Schedule an appointment to see our showroom yourself! This should go without saying, but you should always make sure to choose a sunroom contractor who is licensed and insured. There’s a lot that can go wrong on a construction site, so you want to choose a contractor who puts safety and professional reputation first. If you live in the Orange County area and you are ready to start sunroom construction, we would love to have the opportunity to submit a quote. It doesn’t cost a thing to get started, so contact us for your free, in-home estimate today.